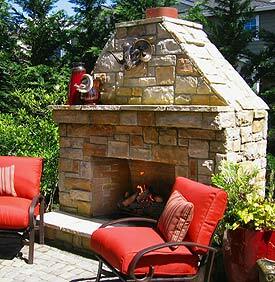 Warmth providers range from your basic rock-circled fire pit to architecturally pleasing fireplaces. Start with our primordial attraction to fire. Combine that with a move to embrace the outdoors as an extension of the living room. Add a dash of chilly nights. And what do you get? The addition of outdoor fireplaces and fire bowls in ever increasing numbers. 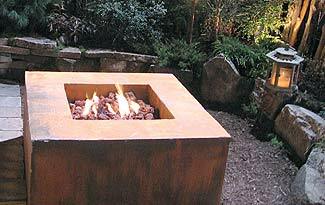 Splashed across the pages of magazines and retail flyers, featured on TV and at home and garden shows, these warmth providers range from your basic rock-circled fire pit to architecturally pleasing fireplaces. Throw another log on the fire, invite friends and family over and celebrate the good times. Cough, cough, hack, hack, wheeze, wheeze. Oh, did we forget to mention that when you burn wood, you get smoke? Smoke pollutes the air, inflames lungs, poses extreme health risks for young children, older adults and those with lung and heart diseases, and taints clothing, skin and the night air with its acrid scent, overpowering the delightful fragrances of our garden flowers. Some wood-burning features are smokier by nature of their design. Inefficient combustion produces more smoke. With their 360-degree, open-air venting and lack of a chimney, fire-pits are the least efficient burners. Units with a screened cover and "chimney" (a small spout on the cover) don't significantly increase efficiency. Chimineas do a better job of directing air flow in and out of the fire, improving combustion; however, the chimney's short stack releases smoke at eye and nose level. Additionally, smoking out your neighborhood might land you in legal hot water. If smoke from your recreational fire enters neighbors' properties, causing damage or creating a nuisance, don't be surprised if authorities come knocking on your door to tell you to put out your fire. In King, Kitsap, Pierce and Snohomish Counties of Washington, Puget Sound Clean Air Agency enforces the law. In Oregon, for the cities of Durham, King City, Rivergrove, Sherwood, Tigard, Tualatin, West Linn, and Wilsonville, and in unincorporated portions of Washington and Clackamas County, this falls under the jurisdiction of Tualatin Valley Fire & Rescue. Unfortunately, many are unaware of the law until the authorities, literally, put a damper on their evening of fun around the fire. But don't despair, we do have options. Consider the many choices of natural gas or propane-burning fireplaces, fire-pits and -bowls, and chimineas available from home improvement stores, specialty retailers and on-line sources. Improvements in technology and materials match the appeal of a wood fire while offering warmth without smoke. They turn on simply and quickly, providing heat almost instantly. When it's time to turn in, turn the unit off and retire--no need to wait for the fire to die out. Because they lack smoldering embers and they don't throw sparks, they are safe to use on wooden decks and during times of drought and high fire danger, when wood fires are banned. (Check with local authorities regarding regulations.) Many models are also portable. For Dan Brungardt and Steve Girolami, a natural gas burning fireplace was the only way to go to ward off the chill in the evening air. They sited their fireplace at the edge of their cobblestone patio, just a few steps outside their kitchen nook. There it serves as a privacy wall between them and their neighbors, and as a wonderful garden focal point visible from their front door. Built from the same stone that accents their home, the fireplace looks as though it has always been there even though it is less than a year old. They added brightly cushioned chairs so they and their guests can linger and visit around the fireplace. Striking art pieces and beautifully glazed containers stuffed with choice plants decorate the space. It is the perfect addition to their Mediterranean influenced garden. "In summer, we use it almost every night. We come home from work, turn it on, pour a glass of wine and relax by the fire," exclaimed Dan. "I love it, absolutely love it! It is safe and convenient and there's no stink or mess." Their choice highlights the importance of selecting a feature that complements the garden. A fire-bowl, no matter how elegant, would be at odds with Brungardt's and Girolami's garden aesthetic. 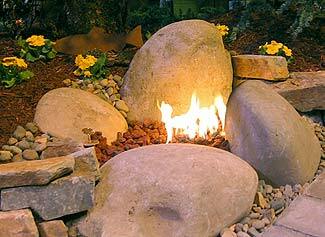 For small gardens, consider this unit composed of a few large rocks around a lava rock center. During the day, it blends into the background, allowing the garden to take center stage. But at night, when it fires up with a simple twist of a key and a match, it commands a bit more attention while encouraging a kick-back, feet-up attitude. With its clean lines and geometric shape, this feature would be at home in both contemporary and Asian gardens. When not lit, it offers additional seating in the garden. John Frankel, store manager for NW Natural Appliance Store in Portland, Oregon, advises, "You can connect (your unit) to your home's propane or natural gas line, or you can hook it up to a standard 20 gallon propane tank." You can purchase an additional tank or use the tank from your BBQ grill. Ten feet of one-half inch flexible pipe lets you tuck the tank around a corner or behind a shrub. You can also disguise the tank with a decorative wooden cover. An outdoor rug will cover the pipe and nicely finish off your outdoor space. Wood-burning features can often be converted if the unit is engineered in a way to accommodate the gas line and still allow good airflow. The staff at NW Natural Appliance Store will gladly guide homeowners through the process. They also sell the parts to build your own unit, which offers savings over purchased units. If you live outside the Portland Metro region, check with your natural gas provider or the yellow pages for retailers that sell natural gas or propane-burning units and offer similar services. Yes, there are many ways to warm the night without the mess and safety concerns of wood-burning fires. Add a dash of good food, good company, lively conversation and heady garden fragrances and you've got the perfect recipe for the creation of many happy memories. Q: What's in wood smoke? Particulate Matter (PM). Tiny solid or aerosol particles measured in micrometers, some as small as 2.5 micrometers in diameter or smaller. Compare that to an average strand of human hair at 70 micrometers. PM's minute size allows them to be easily inhaled into our lungs and respiratory tracts, causing structural and chemical changes, and damaging the alveoli (tiny air sacs where oxygen enters the blood stream). PMs act as carriers for toxic or carcinogenic materials. PM2.5 is able to travel even more deeply, lingering for hours or even years, thus earning the reputation as the most damaging to lung health. Closed doors and windows, even in new energy-efficient, weather-tight homes, do not prevent these particles from entering homes. Carbon Monoxide. A product of combustion, this colorless, odorless gas interferes with oxygen delivery in the blood. It is toxic at high levels. Volatile Organic Compounds (VOCs). Wide ranging compounds, including benzene, a known carcinogen, and creosote, a probable carcinogen. These generally lack color, taste or smell. They either affect our health or contribute to smog, or both. Polycyclic Aromatic Hydrocarbons (PAHs). Some of these can cause cancer. Let's not forget Acrolein, Formaldehyde, and Nitrogen Oxides (NOx). Affects include eye and respiratory tract irritation, headaches, bronchial congestion, lung scarring and possible cancers. Q: What about artificial wax firelogs? Wood fiber and wax are the two main components. Wood fiber generally consists of cellulose; wood resins act as glue to hold the cellulose together. Historically the wax used was paraffin, a derivative of the petroleum industry, with a relatively high oil content. However, there is a move within some companies to consider alternatives, such as plant and petroleum oils and stearic acid, solo or in combinations. Java-Log®, a newcomer on the market, is comprised of used coffee grounds, not wood fiber. All of them are a by-product of other industries. For instance, Java-Log® is comprised of spent coffee grounds that would normally be sent to landfills. Q: What's in their smoke? Approximately one-fifth the amounts of PM2.5 and carbon monoxide as cordwood. While the Duraflame products released less CO2 than cordwood, they released approximately twice the amount as the other products tested. Approximately one-fifteenth the amount of PAH as cordwood. The heat content of these logs is quite high (12,620 to 15,190 Btu/lb, dry basis) compared to oak cordwood (about 8,300 Btu/lb). Other studies report that these products also produce less creosote and other emission components, such as formaldehyde and benzene. Java-Log® is gaining recognition as the most environmentally friendly fire log on the market. It uses a renewable, natural vegetable wax, it's wrapped in 100 percent recycled packaging and it lacks the chemical odor common with artificial wax fire logs. As reported by OMNI Consulting Services, Inc., considered one of the leading laboratories in North America for testing environmental impact and analysis performance for combustive products, Java-Log® produces 86 percent less creosote deposits, earning it status as a CSIA (Chimney Safety Institute of America) Accepted Product. Q: Is burning wood more environmentally sound than using natural gas or propane? Wood is a renewable resource, unlike fossil fuels. However, when wood smoke forces neighbors to close windows and turn on air conditioning to cool the house instead of relying on refreshing evening breezes, it effectively eliminates any sustainable benefit from burning wood. Ultimately, the most environmentally conscious response is to don another layer of clothing and cozy up under a lap rug. Top image photographed in Brungardt's and Girolami's Garden.